The European honeybee (Apis mellifera) is not native to North America. The Pilgrims introduced these bees when they arrived with some at Jamestown in the 1600s. Today, honeybees are considered the most important group of crop pollinators and are supplied in large numbers to the agricultural business, and are easily transported. For a while now we have been hearing about colony collapse, and that honey- bees are under threat, but that’s only part of the story. Sadly, it is not just honeybees that are on the decline but all pollinators, which include our native bees, butterflies, wasps, moths and beetles. Although it has seemed that the phenomena of collapse is fairly new and often attributed to things like cellphones, in actual fact the decline of bees and pollinators began in the 1950s and has been increasing tenfold ever since. 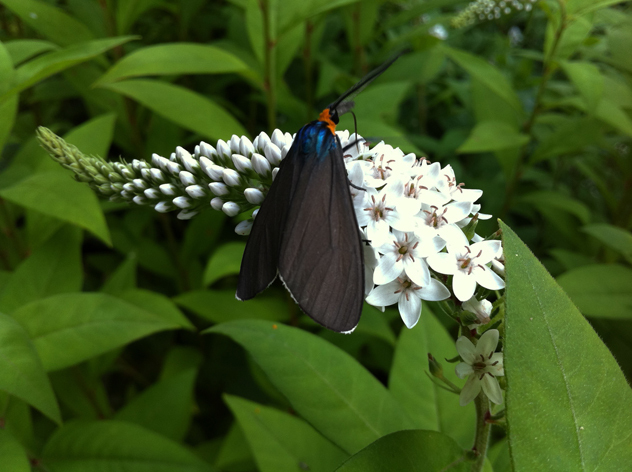 The Xerces (pronounced Zersees) Society for Invertebrate Conservation in Portland, Oregon, created a Red List of our endangered pollinators that contains 59 butterflies and moth species and 57 bee species that are currently at risk of extinction. 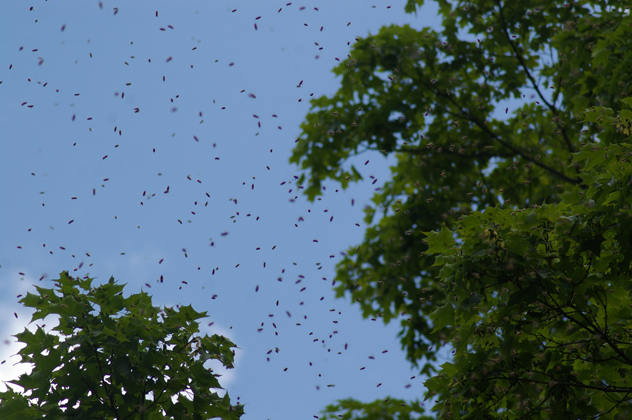 It is estimated that there are 20,000 species of bees worldwide. The U.S. alone has roughly 4,000 known native bee species. I had no idea there were so many native bees nor that most of them are solitary in nature, unlike the hive-loving social honeybee. In fact, 90 percent of our native bees are single working mothers constructing and providing for their individual nests, without help from other members of their species. Some of the more common bee names include sunflower, squash, sweat, leaf-cutter, mason, plasterer, carder, and digger bees. 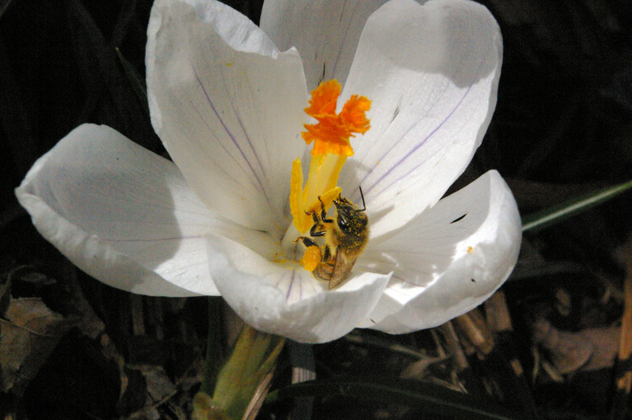 In many cases our native bees are far more effective than honeybees for pollinating fruits and vegetables because they forage over longer periods starting in very early spring and going late into the fall when conditions are extremely damp and cold and when the warmth-loving honeybees are out of pollinating action. Although both male and female bees pollinate, it is the female who collects nectar and pollen from flowers for food for her offspring. But contrary to popular belief, bees are not the only pollinators. Wasps have similar life cycles to bees, and butterflies pollinate flowers as well as flies and beetles. Hummingbirds and even some bats are also important pollinators. Why are pollinators important? Some of the most nutritious and best-tasting foods are the result of insect pollination, including 58 crops in the U.S. Alone: apples, oranges, blueberries, melon, carrots, broccoli, onions, and almonds to name only a few. In a Cornell University study, crops pollinated by honeybees and other insects contributed $29 billion to U.S. farm income in 2010. Besides providing food, pollinators are essential to plant reproduction by helping to keep plant groups healthy. A good example of this is the willow. Many willow shrubs and trees have separate male and female plants and during pollination the pollinating insects transfer the pollen from the male to the female plant, thus ensuring continuation of the species. We know that willows help the land thrive by stabilizing the soil, preventing soil erosion, and helping to keep our streams clear for aquatic life. It is also true that fruit- and seed-eating birds benefit from pollination, and pollinating insects are themselves food for birds and spiders. I am only scratching the surface here, but you get the picture of how intricately entwined we are and how necessary our survival is on pollinators. Why is habitat so important to pollinators? Agriculture has been the largest factor in removing habitat for pollinators, taking up to 36 percent of the world’s land surface. Though agriculture may produce beautiful green fields, those fields are not filled with a wide diversification of plants, but rather mono crops are grown that rely heavily on pesticides. There is very little land left and what is left is fragmented. 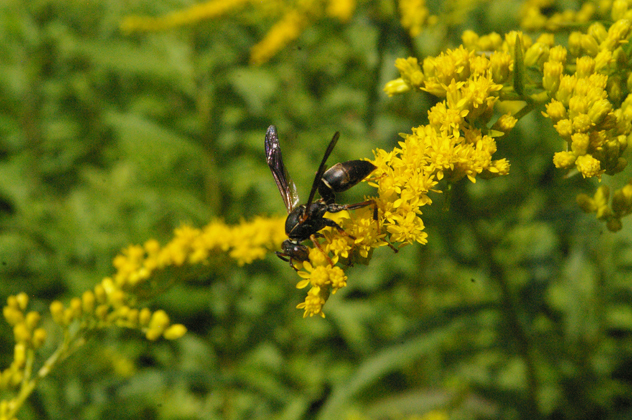 Nevertheless, an important habitat for pollinators are those unused areas that are often located by roadsides, creeks and between fields and are prone to pesticide drift and other types of harmful “maintenance.” Millions of pounds of pesticides are applied to farms, fields, lawns, gardens and roadsides annually. Insecticides kill pollinators directly, whereas herbicides kill flowering plants and prevent plant diversity that supplies the pollinators with the pollen and nectar they need. Pollinators also need large unbroken pieces of land to do their work. Imagine that you are a bee and you have a patch of wild flowering plants along a highway to gather nectar from, but that the next patch is 20 miles away because there are hundreds of acres of corn planted in between. To make that journey you will have to use up all the nourishment you have gathered in order to have the energy to get to your next food source — a zero sum game if ever there was one. Suffice it to say, modern non-organic agriculture has caused the greatest loss of native insect populations. 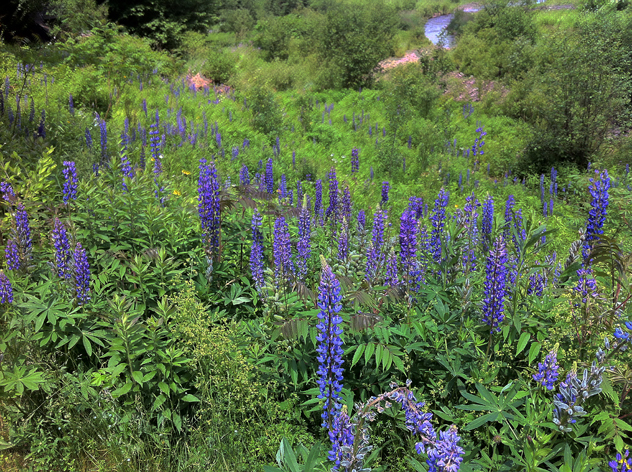 Lupine meadow – Sondra Freckelton’s garden. Leaving wilder area as meadows help our pollinators. Why is plant diversification important to pollinators? The American lawn, is also a mono culture and another major contributor for removing diversified plants from their natural habitat. The suburban lawn made up solely of turf grass reduces nesting opportunities and provides no food value. Not only have we removed important diversity of plants but, per acre, our lawns receive FOUR times as much chemical pesticide as any American farmland. One thing we gardeners can do is raise our mower higher, 3 or 4 inches, which will allow the clover and violets to come up and stay up! Having a little more variety in your lawn provides a richer habitat for all pollinators. Before learning this I had turned over large areas of my lawn to what I called “patterned meadow” and what I have found is that the wildflowers in the fields show up very quickly in the unmowed grass. I also found that turning over areas of lawn to meadow has reduced mowing time dramatically and, so, I use less fuel. I have already seen many more dragonflies and butterflies in this newly created mini-meadows. We need to retrain our brains about lawns; a solid green lawn of turf is not sustainable for the environment, and letting our friends and neighbors know why and how they can contribute to a better environment can and will have huge consequences. Lawn turned into wild meadow. How can we help Pollinators? I am in my early 50s and I recently realized that in terms of my gardening knowledge I have one foot in the past — which informed how I made the garden I have now — but my other foot is in the future and interested in what will be sustainable for my garden as I go forward. Many of the habits formed and things I learned about gardening 27 years ago were based on a very different world viewpoint. The more I read about the state of our planet the more I realize I need to change some of the ways I do things, starting in my own garden. 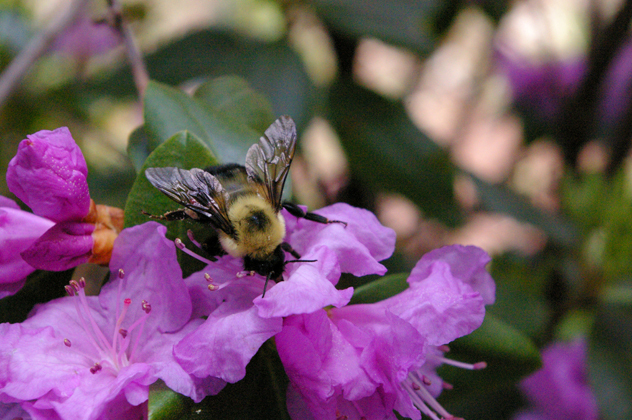 Some things we gardeners can do to help these crucial pollinators survive. 1. STOP using pesticides. Period. Over-the-counter pesticide use is unregulated and research has shown that the worst runoff of pesticides is found in suburban and urban areas — much worse than in heavily sprayed farming areas. It is the homeowner who is doing the most damage by spraying his/her lawn and or flowers. If you see your neighbor using pesticides, NOW is the time to have a talk because that spraying can affect your ability to attract pollinators. Try suggesting to your neighbor that instead of buying an over-the-counter pesticide to stop aphids or some other pest, he/she should first try and drown the pest with the garden hose. Follow up with a homemade recipe of safe soap: to one gallon of water add one tablespoon of vegetable oil and one tablespoon of dishwashing soap; mix well and pour over the plant under attack; repeat if conditions continue. 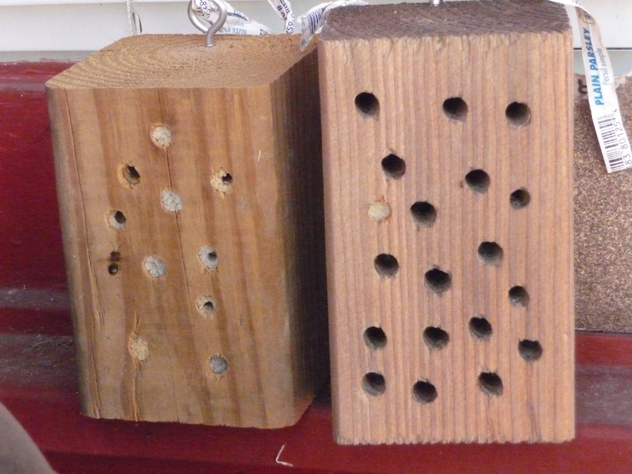 Anna West photo and bee block nest provides mason bees with a home. .3. Provide a foraging habitat which includes good sun exposure, cultivating a diverse range of plants to provide pollen and nectar throughout the growing season. By planting large flowering clumps three feet in diameter of an individual species you will make it easier for pollinators to locate in the landscape. 4. Planting early- and late-flowering native plants can help extend the supply of nectar at crucial times. Research has shown that native plants are four times more likely than nonnative to attract pollinators. And I was surprised to learn that native woody plants (trees and shrubs) support 14 times as many species as ornamental species. I love ornamental/ hybrid plants and I don’t think any gardener is going to give up on them all, but when given a choice do think twice about planting a native plant before a hybrid plant. An example would be to choose the common purple coneflower (Echinacea) over one of the numerous and often bizarrely colored hybrid coneflowers that are now available. Native plants do not require fertilizers, they usually require less water than nonnatives, and are less likely to become invasive than nonnative while providing permanent shelter and food for other wildlife. When selecting nonnative plants, heirloom varieties are often preferable to ornate varieties and double-flowered hybrids because hybrids tend to produce less nectar and pollen as a consequence of having been bred for their showy flowers. 5. Last but not least: I live in a rural part of upstate New York and every August just as the wildflowers are peaking the road crew comes along and mows them down. I know there is no bad intention here, but there must be a more sustainable solution. In Texas, Lady Bird Johnson saw how much time and fuel was wasted mowing the edges of highways and she moved to stop this practice by making it less unessential. She spent the money saved on bluebonnet and other native wildflower seeds and had it scattered all along the highways. Now there was no need to mow, and it looked wonderful. 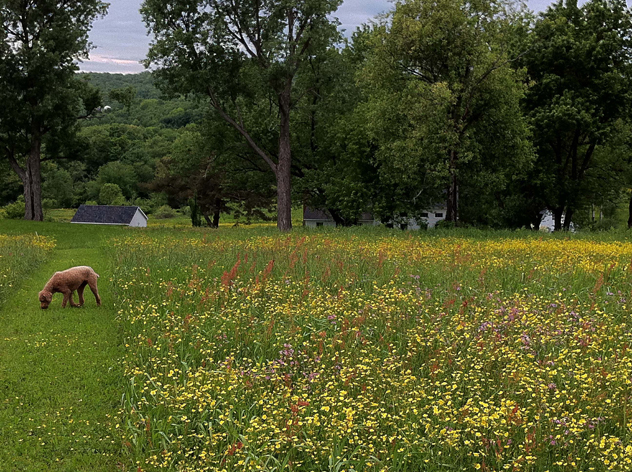 Here in New York State we have some of the most beautiful wildflowers of anywhere in the world and yet, somehow, a mowed strip along our roads is deemed preferable to the beautiful natural wildflowers that could be left for all — including the pollinators — to enjoy. Just think of the millions of miles of country roads and highways that could be providing additional diversified wildflowers that would help our endangered pollinators. Even if the town road crews delayed the mowing until late fall, when the plants have stopped flowering and gone to seed, that would be an enormous help. Author’s acknowledgment: This article could not have been written without the help of The Xerces Society’s guide Attracting Native Pollinators: Protecting North America’s Bees and Butterflies. I encourage you to consult this book for a more in-depth analysis and to visit http://www.xerces.org for a list of native plants to plant in your area.